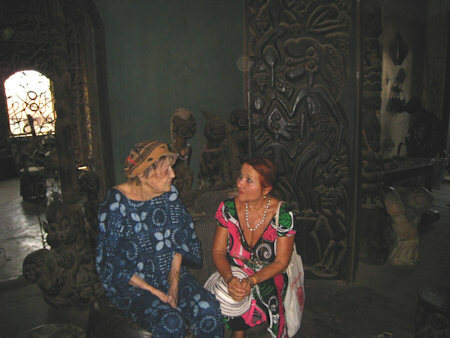 Left: Susanne Wenger, Austrian Sculptor and priestess (Olorisha) in Oshogbo, Nigeria. I visited her in December 2008 and she died January 2009. The work of Susanne Wenger has been the biggest inspiration for me since 1983 when I got her book: "Living with the Gods". She worked on monumental Orisha Sculpture in the Sacred Groves in Oshogbo. All the logs which had been waiting in the corner of my studio for nearly 20 years came to life when I decided to carve orishas. Eleguá - he holds the keys of destiny, his colours red and black symbols of life and death, he can be an old man or a child, he symbolizes the coexistence of positive and negative poles of all things and their opposite. in Yoruba his name Esú. Most powerful sacred instance,whose presence is inevitable to all rituals and all that goes on in life. He is the trickster in the universe. Shango - The mighty God, whose instrument is lightening and thunder, unloved child of Yemaya, hard-working, courageous and friendly, he can also be a liar and a slanderer, a womanizer and a gambler. In spite of his many lovers, he can be a good father and is a lover of music and dance. Osún - (pronounced Ochun), the Goddess of "the waters of life". The river Osún in Oshogbo.Nigeria, is named after her and is her physical self. Goddess of love, frivolous and light hearted, she is always well dressed and in a mood for a party. Yemaya: mother of the child of fish. Mother of the god Shango, patroness of the waters and of the surface of the sea. She is only invoked after touching the soil with the tips of one's fingers. Oyá: Goddess of the storm preceding lightning and thunder. Shango's beloved wife. 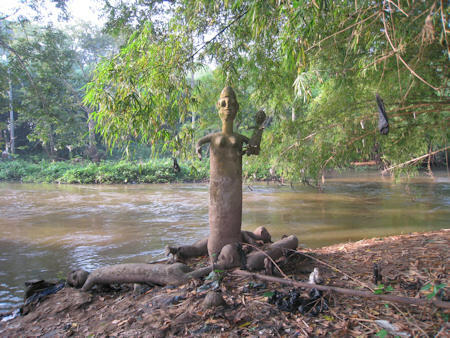 The river Niger is called Oyá in Yorùbá and the the goddess' alter ego. Armed with 2 swords and hurling fire, she fights beside Shango. She always wears the nine coloured skirt, (in this sculpture the nine colours are on her arm)}. She rules over the cemeteries, and awaits the deceased at the gate. Osaín or Òseyìn, the god of the magic-mystic potencies of the herb. He is one legged like the plant. His material substitute in the shrine is a wrought iron staff with a bird on top which branches out like a plant. Osain in Cuba, conceived by the earth he lives in the depth of the forest he treats and heals. He has a dog with him.